This article one of Zelda Informer’s bombers articles, is a look at the ramifications of the events in Majora’s Mask. The article basically refutes a theory (which is described in the article) and quite thoroughly does just that. The article first shows various definitions of multi-dimensional theories (they’re basic don’t worry) and compares the Termina-Hyrule relationship to some well known tales such as the Narnia multiverse, and the rabbit hole in Alice and Wonderland. However, there is one especially important key similarity between Narnia and Termina, and that is the nature of the connection between them and other Worlds. Narnia features a “linking-room” between the Worlds called the ‘Wood between the Worlds’. Through this Wood, the characters can use magic to enter different Worlds through a number of magical pools. 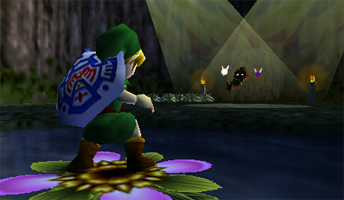 Similarly, Majora’s Mask features a similar wood connecting Termina and Hyrule (which may be the Lost Woods itself, or the underground cave Link stumbles into when chasing the Skull Kid). This concept seems to have been the only feature of Termina directly inspired by Narnian lore. A similar concept was used in the Tim Burton film The Nightmare Before Christmas to connect Halloween town to Christmas town and the other holiday Worlds. You see, Link being in the Adult timeline at Point 5 is nigh irreconcilable with what we seem to be intended to believe. That is, that the Hero of Time “journeyed into the flows of time” and left the land of Hyrule; that is, left Hyrule in the Adult History, and that that is why he did not return to stop Ganon when he returned to terrorize Hyrule. But if Link is in the Adult timeline again, doesn’t that blatantly contradict what seems to be the canonical sentiment–that he is gone completely, living in a new timeline? I’d say it definitely does. This article is a really intense read, and probably not for everyone. I debated about whether to feature this article because a few pictures are missing, but if you pay attention you can figure out the intent of the author. So which definition of a multiverse do you think Termina belongs to? Is it a parallel world? Or is it an alternate history? Let us know what you think in the comments.